The 12 articles in this book address a topic made acute by the Great Recession of 2008. From Thomas Piketty’s Capital to Bernie Sanders’ campaign speeches, the issue has been examined from many different angles but not with the sharp Marxist focus of an economist who understands what inequality means on both a theoretical and a personal level, having grown up in a hardscrabble company town in Pennsylvania. Written in language that ordinary workers could understand, each chapter is filled with data illustrating the ever-widening gulf between the 1% and the rest of us. Chapter two, which has the same title as the book, documents the great divide between the plutocracy and the average American in jaw-dropping detail. Using the Gini coefficient, a measure of inequality with 0 being a state of perfect equality and 1 tantamount to total inequality, Yates observes that the numbers have been moving steadily toward 1 for the past four decades. In fact, the Gini coefficient of the Roman Empire not long after the death of Jesus was more equal than the US today. With Jesus preaching that “it is easier for a camel to go through the eye of a needle, than for a rich man to enter into the kingdom of God,” one can understand why opposition to the status quo has reached a religious fervor today. As a socialist, Michael Yates tends to look askance, however, at Great Men who would be saviors of the poor and the working class. In the final analysis, it is up to those who sell their labor power to transform society and make wage slavery a thing of the past. Beyond the book’s value as a source of powerful arguments based on hard data, it is like everything else that Yates has written – an eminently readable work that can even be described as entertaining in the fashion of a Jonathan Swift essay. Shunning the pedantry of many economists, including those on the left, and drawing upon a lifetime of experience dealing with the boss whether in a coal company town or in academia, Yates has some sharp observations rendered in anecdotal fashion. Chief among them is an incident that occurred on a nature hike near Santa Fe, about 7000 feet above sea level. Yates and his wife ran into another group of hikers that included an older man who struck up a conversation about what brought Yates to Santa Fe. He explained that he was collecting material for a travel book written from the viewpoint of an economist – the superlative Cheap Motels and a Hot Plate: An Economist’s Travelogue. When asked what he had observed to that point, Yates replied: environmental degradation, suburban sprawl and growing inequality. This did not sit well with his interlocutor who came across like Pangloss in Voltaire’s Candide. For him, everything was getting better. People were living longer and getting healthier. As a sign of what capitalism could bestow, “Almost everyone in the country lives within an hour of a Wal-Mart Supercenter.” Eventually, the Panglossian fellow was revealed to be an economist, just like Michael, but with a difference. As a conventional member of the Dismal Science profession, he was used to covering up for the ruling class through the application of “neoclassical” theory. While the statistics in The Great Inequality will leave you feeling angry and ready to make a revolution (if you hadn’t reached such a state long ago), the discussion of the daily assaults on the spirit and body for those who sell their labor power will push you over the edge for sure. Chapter five, aptly titled “Work is Hell,” examines factory and office existence today, suggesting that even if the Gini coefficient was 0 – in other words, pure equality – there would still be compelling reasons to abolish a system based on the private ownership of the means of production. I was struck by the mention of a certain class of workers who might not be thought of ordinarily in terms of Engels’s Condition of the Working Class in England, namely the crews of cruise ships that take people down to the Caribbean islands. They tend to be people of color from poor countries that do the most backbreaking work. If they are injured on the job, they must pay their own way back to their homeland even if better care is available in the US. It is quite a comment on the values of Nation Magazine that it has used Holland America for its fundraising cruises with the leftist glitterati. Holland pays its largely Filipino and Indonesian crew $300 per month for a 10- to 13-hour workday, seven days a week. In addition to screwing its workers, their ships constitute an ongoing threat to the environment. In just one violation, Holland dumped 20,000 gallons of raw sewage into the waters off Juneau, Alaska. 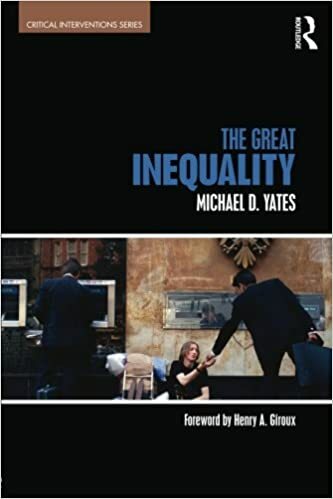 After a yeoman job of revealing the economic divide in the US, Yates has begun to connect the dots between politics and economics, an obligation that faces everybody who considers himself/herself a socialist. In an April 30, 2016 article for Truthout titled “Let’s Get Serious About Inequality and Socialism,” Yates makes the case for socialism – not the Swedish model that no longer exists but the classless society envisioned by Karl Marx that remains just as necessary for humanity and nature as it was in the nineteenth century. Thanks, Louis, Much appreciated. You’ve been a good friend. Not to mention perceptive!! !